Those rather disappointing and dull comments from Zinedine Zidane round off our night's coverage of the Champions League. It's an early start for the Europa League tomorrow. See you there! 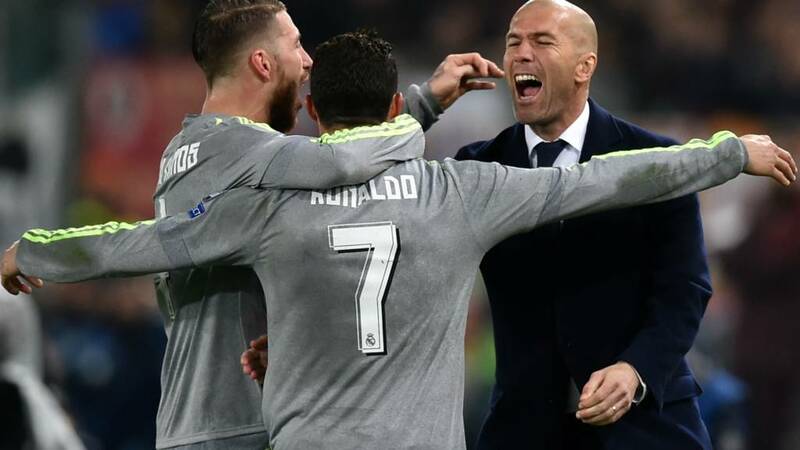 Real Madrid boss Zinedine Zidane: "We’re happy with the game and the result. We knew it was going to be a tough game but we fought to the end. In the first half they pressured us and that's normal in a difficult Champions League tie. "Cristiano Ronaldo was great but then again so was everyone. Even those who did not play were important for team morale. I'm happy with Jese's goal, he deserved it for his efforts. I'm happy and I’ll try to ensure the side keeps on improving." Italian football expert Mina Rzouki: "It is true everyone wants to go to the Premier League. But for Massimiliano Allegri, Chelsea would not be a great match, he is not suited to the English game yet. "At Juventus he has the chance to win the Champions League at some point. They are at the beginning of a process, he has brought in 12 new players who are very young. If they keep building they will reach the Champions League at some point. Allegri is like a god in Italy." Wolfsburg goalscorer Julian Draxler: "We played a very good game. The last two goals for Gent weren't so good, but we have all possibilities to go through to the next round. "I’m always happy when I’m scoring and, of course, the Champions League is something special for me, I like to play in this tournament. Yes, it’s a good result for us and if we play like that in the second leg we will go through." Asked about playing in the Premier League, the German says: "Of course, it’s a very nice league, but at the moment I’m happy in Wolfsburg, we’re still in the Champions League and that’s a dream for us." Roma captain Alessandro Florenzi: "We played one of our best matches this season. Sometimes you also need a bit of luck, because we actually played well and this result is not fair. Our fans applauded us. "I have been a little unlucky with Ronaldo's shot, I managed to deflect the ball but it ended exactly where Wojciech [Szczesny] couldn't reach it." What percentage of Liverpool fans would still like to have Pepe Reina in nets? Napoli goalkeeper Pepe Reina has been speaking to the BBC European Football Show which is on 5 live right now. They lost 1-0 to Juventus at the weekend, as the Turin side overtook them at the top of the Serie A table. But their performance in the game has actually reiterated Reina’s title belief. Vince: If Gent can grab the first goal back in Germany who knows? Gavriel Seitler: Although they didn't win Gent nearly performed a great escape. After four ties then it's advantage - of varying degrees - to Real Madrid, Wolfsburg, Paris St-Germain and Benfica. Next Tuesday night we have Arsenal v Barcelona and Juventus v Bayern Munich - massive - while on Wednesday it's Dynamo Kiev v Man City and PSV v Atletico. Roma must score at least two goals in the Bernabeu now. A tough, tough ask. A very successful Euro debut for Mr. Zidane. Rhys Cadogan: Brilliant goal by Jese.. It looks as though Real Madrid are finishing Roma off in the first leg. That puts a different complexion on the tie as Gent grab a second. They've looked a different side since going three down. One substitute Kenneth Saief swings in a teaser of a cross from the left and another replacement Kalifa Coulibaly applies the subtlest of headers at the near post. Francesco Totti is now on for Roma. Surely too little, too late though. That could well be that! A huge goal in the tie as Real hit Roma with a sucker punch. It had been all Roma but Real counter and substitute Jese carries it down the right wing, hits an early shot through a defender's legs and bang into the bottom corner. Silence in the Olimpico.